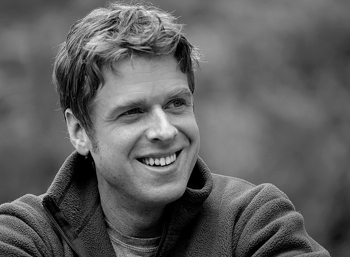 This month, our featured guest is Chip Phillips. We want to thank Chip for taking the time to answer our questions, and share some of his insights with us! Please visit his site links to see more of his incredible work, and to let him know you enjoyed this interview. :: How did you get your start in photography? What was it about landscapes in particular that made you focus on them as a subject matter? Do you ever do weddings or much in the way of portraits? I have two people to thank for my start in photography: my wife and my dad. My wife has always been fascinated by photography, and she encouraged me to give it a try. In about 2005 my dad gave me his old Pentax Spotmatic film SLR. I really enjoyed playing around with it, and soon I was hooked. Given my lifelong love of the outdoors (I grew up hiking, backpacking and boating), the progression to shooting landscapes was a natural one. :: You’re a classical musician as well; how does music play a part in what you do with the camera? Is composing with one creative tool similar to the other? Well, one characteristic that I've always had is a love of learning. I love pushing myself to new challenges. I feel like in that way, I've been drawn to the arts, because you're always learning new things. It's never stagnant—I can never say, “well, that's it. I've learned everything there is to know about music and now I'm done.” Photography is the same way. There's always a new challenge on the horizon. :: Let's say you have to spend a year in solitude on a tropical island. You can only take one creative instrument with you. Do you bring a musical instrument or your camera? Why? This one's easy. I bring my camera. For me, music is more of a collaborative art form; I don't feel like I'm truly creating art unless I'm doing it with others, either in a symphony or a chamber ensemble. 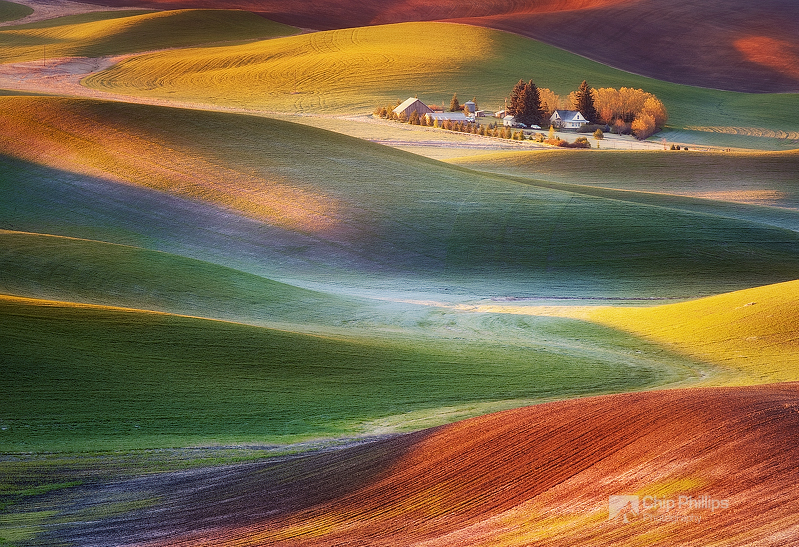 :: You spend a lot of time photographing the Palouse region of Eastern Washington, as it’s near to your home. What challenges, given the popularity of the area, do you find to represent it well in your own work, given your familiarity with it? What keeps you coming back? The Palouse really is a photographer's paradise. There's just so much to photograph, and so much creativity to explore. One can shoot more conventional scenes, or get lost in an abstract world of swirls and waves. The trick for me is finding unique compositions during beautiful lighting. For instance, you see a lot of images of side-lit rolling hills at sunset. But you don't see a lot of images with fog, or frost, or bizarre clouds. I spend nearly two months every year, and log over a thousand local miles exploring the Palouse region, scouting for workshops and new locations. The region just has an endless amount of possibilities. I'm so lucky that it's my backyard. :: What location are you currently ranking as a “Must photograph” spot? 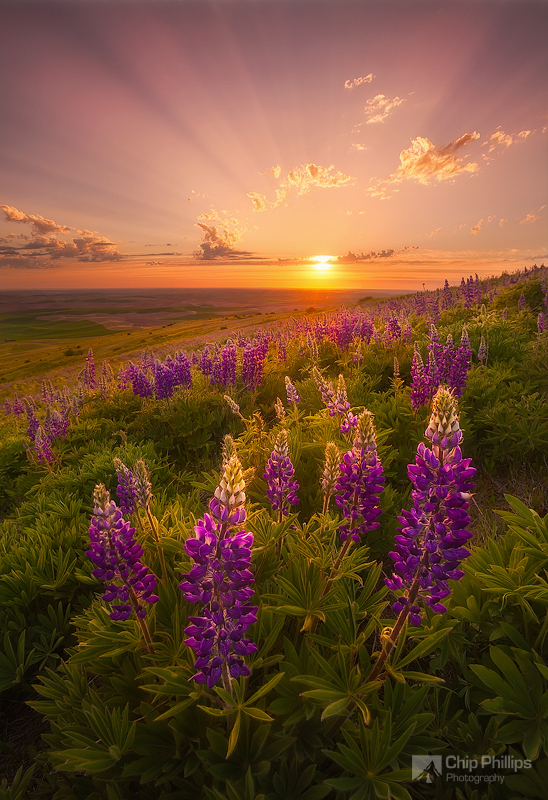 In regards to places that I've visited already, I'd say the Palouse, the Canadian Rockies, the Tetons, Glacier National Park, Mount Rainier during wildflower season, the Columbia Gorge, and the Pacific Northwest coast. Places that I'd like to shoot include Iceland, Norway, Patagonia, the Yukon, Tuscany, and too many more to list! :: You’ve made some great videos for post-processing techniques, can you talk a little about what these include, and why you felt like sharing your tricks with the world? Thanks for the compliment! The videos have been a great success--I'm so honored that there's been such a positive response. Making the videos seemed like a natural thing to do—teaching has been a big part of my life. Before I started teaching photography and image editing, I'd been teaching music for nearly twenty years. :: What is your favorite piece of NON photographic gear that you could not live without? Probably my GPS. I use it constantly to scout places of interest, and to lay down tracks when I'm exploring off-trail, so I don't get lost. When I'm focused, clear-headed, and excited about the conditions and the subject matter. The sleep deprivation. And the long hours of travel. :: Teaching photography versus teaching music, which is harder for students to pick up? Music is much harder. The basic technique of operating a camera and taking a photograph can be learned in a fairly compact amount of time. Learning an instrument takes years. In a similar vein, how much of art, whether music or photography is “born-with-it-talent” and how much is hard work? How much internal skill do you think people can be born with? The most important thing is passion and hard work. To have a deep love for what you do, and a hunger for learning and improving at it. I think talent plays a role, as does having a creative and curious mind, but that insatiable drive to learn and grow is really what sets people apart. :: What is the scariest thing you’ve encountered, or had happen to you while out photographing? 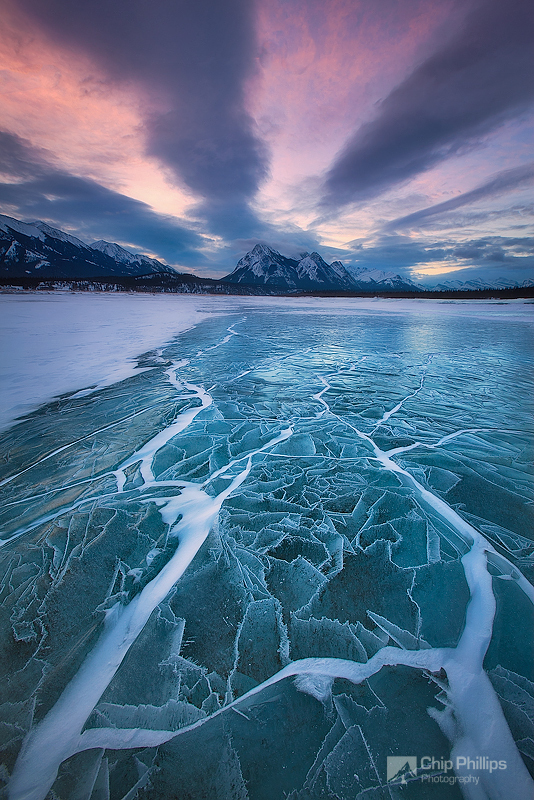 I was shooting at Abraham Lake in the Canadian Rockies in the dead of winter. The temperature was below zero. A huge gust of wind picked up, came barreling across the frozen lake, lifted me up and threw me down headfirst into the ice. I'm really lucky I wasn't severely hurt; I was just pretty shaken and beat-up, and a little bloody. :: What was the most camera gear you’ve ever broken in an accident while on a shoot? And the story behind it? I was at Cape Kiwanda on the Oregon Coast, when a giant sneaker wave came up over the front of the cape. It soaked me and a camera crew that was there filming me for a local TV show. All in all, it destroyed thousands of dollars of equipment. The best light show in the world is Mother Nature's. I seek out extraordinary light and it's one of the main things that keeps me driven as a photographer. I don't add or subtract important elements in my photographs, such as adding sunset color, or sun rays. I'm not necessarily against this, as long as it's disclosed by the photographer. But I just choose not to do it. I don't use HDR software personally, but I think it can produce really nice results when used skillfully. I'm just a hands-on guy, and I like to exercise as much creative control as possible, so I like to do everything by hand. My images are a result of what I remember seeing and feeling at the time. Editing and developing are part of the artistic process. :: Any big projects you’re working on currently you’d like to share? I'm preparing to do a new set of instructional videos. I'm working on some new techniques to share. :: As you continue to refine your craft, what still challenges you the most when you’re out with your camera? How do you deal with creative blocks? Just take pictures. If I'm out in the field, I try to force myself to shoot, no matter how imperfect the conditions may be. I try to come home with at least an image or two that I like. :: In 10 years, where do you think the world of digital photography will be? Even more awesome than it is now.